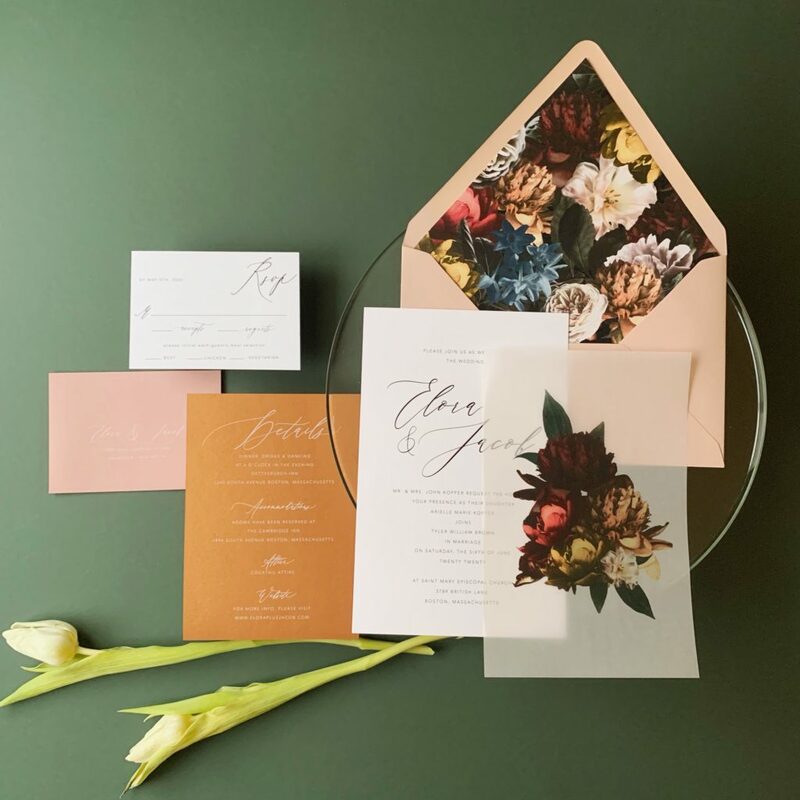 The Elora Suite is a mix & match style invitation suite, showcasing a unique photo-realistic floral design in your choice of floral colors paired with a hand-lettered font. Elora includes 3 cards, along with your outer envelope, response envelope, a translucent overlay, and an envelope liner. Your custom text will be hand-lettered and scanned into your Elora suite. Your envelopes will arrive to you pre-printed. 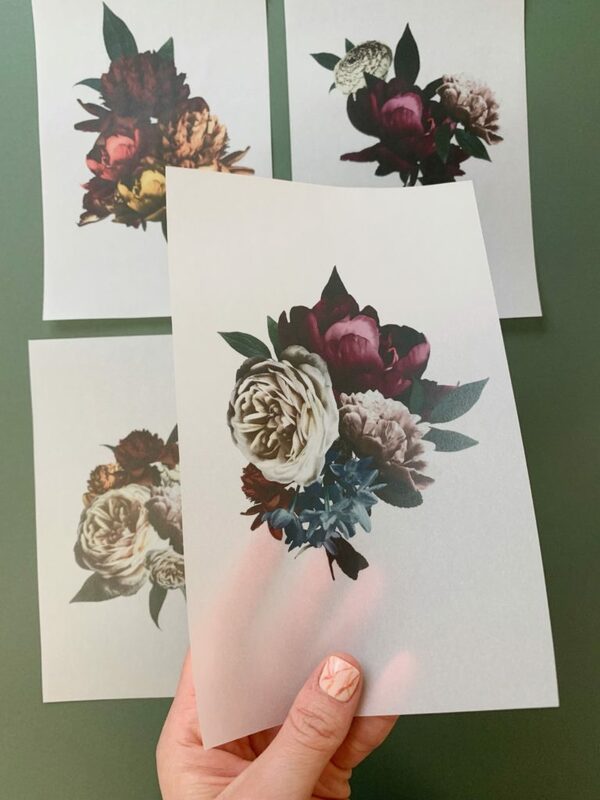 You select your envelope color(s), your Details card color (which will be printed in white ink) and which floral arrangement you’d like on your transluscent sheet! Need a custom color or want to see a certain combo? Just indicate below! All pieces will coordinate with a hand-lettered design + digital font on all cards and envelopes. To see more about our printing types, please view this link. Your response envelopes will be printed with your mailing address. Your return address + guest addresses will be printed on your outer envelopes. This suite does include guest address printing on the outer envelopes! 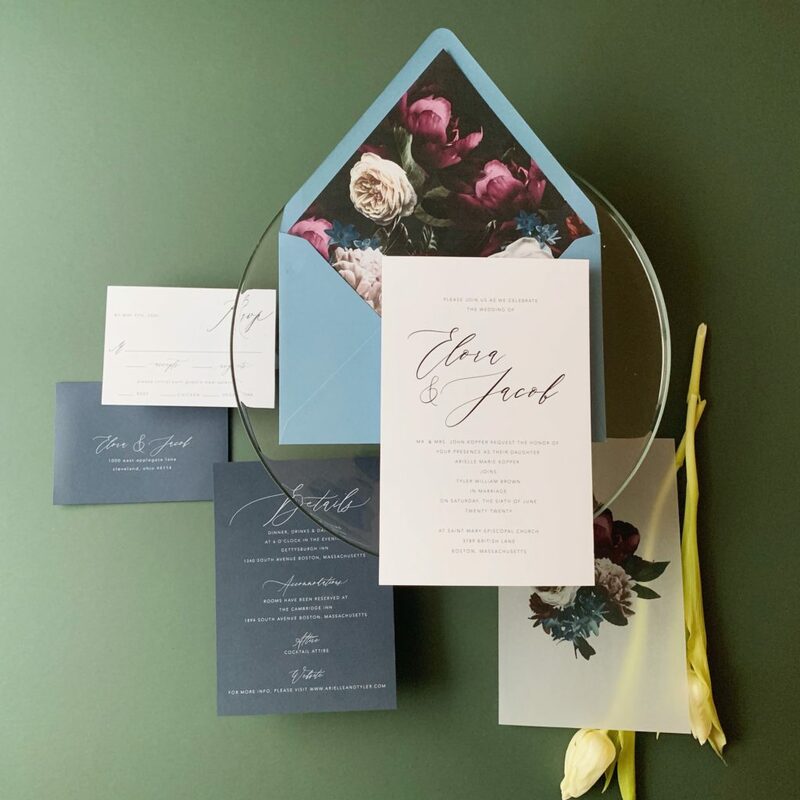 Guest addressing in calligraphy can be done in any solid or metallic color. Fill out the form below. Within a business day or two, you will receive some info and your quote. You’ll pay the invoice and then select your wording options for each card using a questionnaire we provide to you. 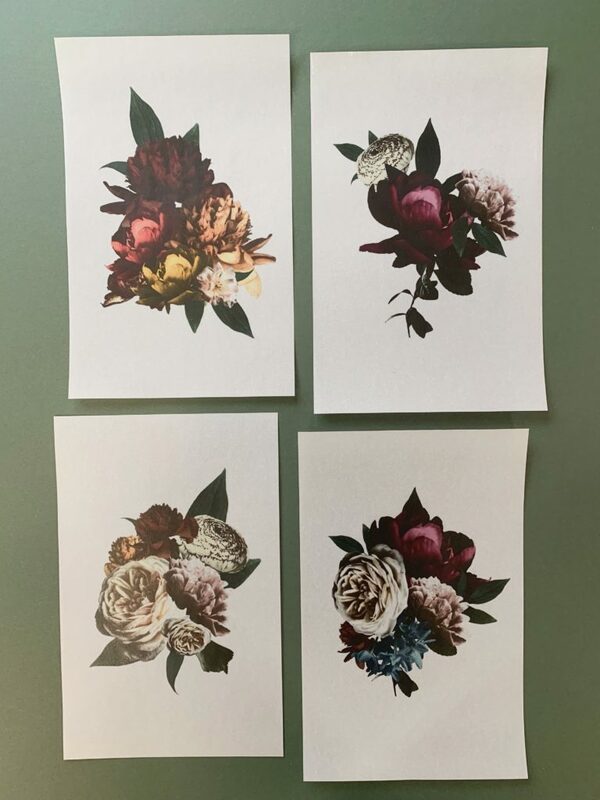 Digital design proofs will be crafted and emailed to you with your customized text and the colors you chose for approval before printing. Once approved, your invitations be produced and then shipped to you. Please note that one round of edits is included in the pricing. 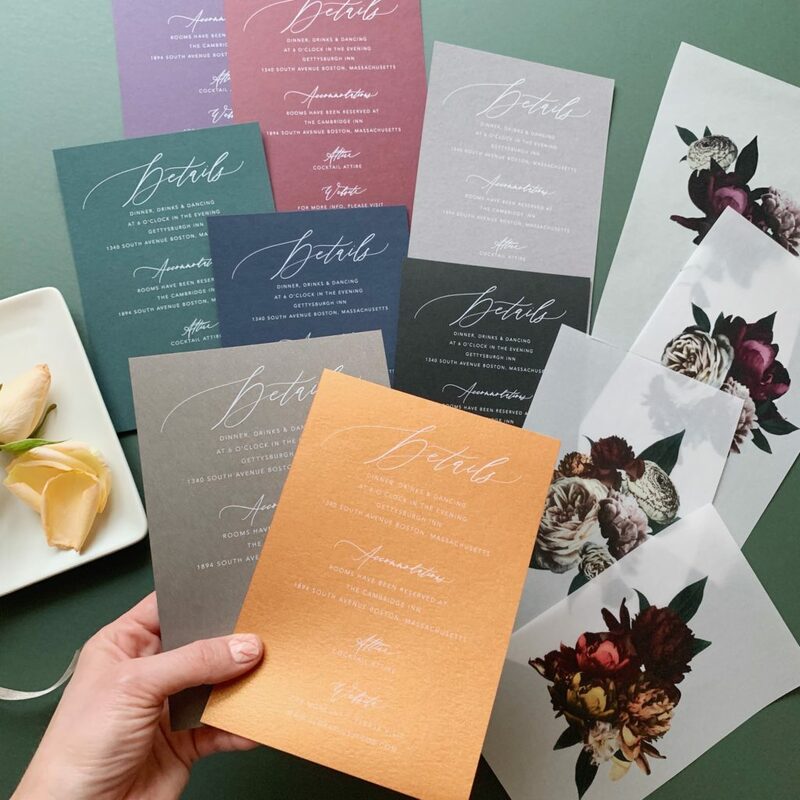 After your suite has been printed, it will be shipped to you with step-by-step instructions to assemble your invitations. Postage will need to be purchased separately. Pricing includes one round of edits to digital proofs (additional rounds will require an upcharge of $50 per round). You will receive digital proofs with a chance to make edits before items are sent to print. 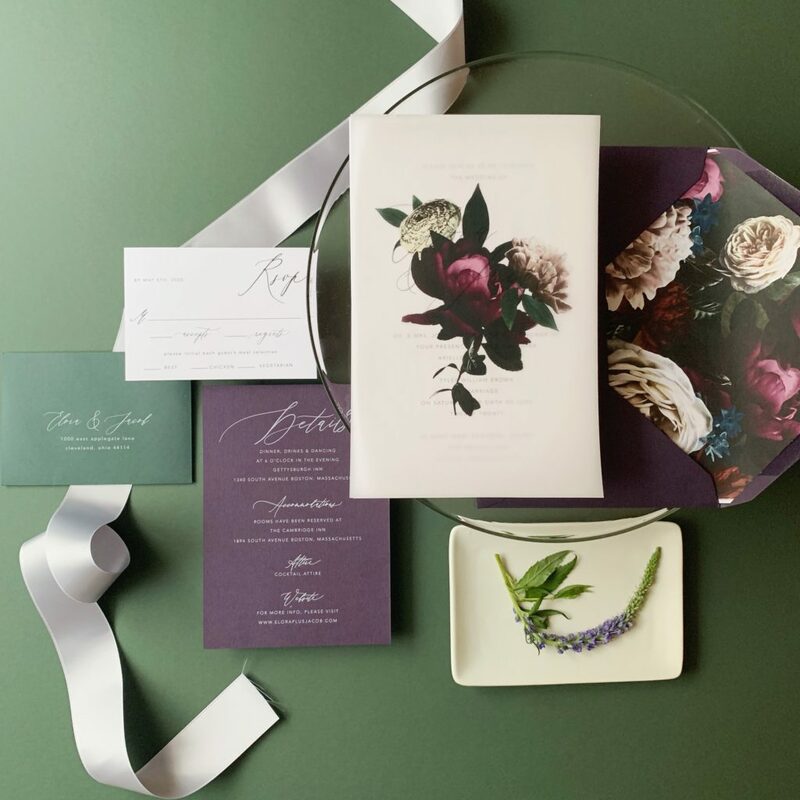 Depending on your paper and color selections, the Elora suite will take approximately 3-5 weeks to be customized, produced and shipped to you, once your final artwork has been approved. Any questions? Just ask in the form below!